TMH Living Well: Curious what it’s like to be pregnant? Hbabieshappenhere). You will see photos and hear reflections from Kelsey and Daina and their husbands Trini and Wayne. In the end, you’ll get to meet the new babies as they enter the world at TMH. Many of you may know Kelsey Loya, 26, who was born and raised in Craig, graduating from Moffat County High School in 2005. Her parents are Nancy and Mike Bauman. She has a younger sister, Kylie. “I am so excited to be a mom. We were really ready,” she said. 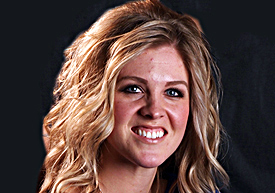 Kelsey is a cosmetologist at New Images Salon in Craig. She works alongside her mom, Nancy. She loves doing hair, and loves living in Craig. The timing of Kelsey’s pregnancy was absolutely perfect. She was able to find out on Valentine’s Day. She did a home test that morning — and the only one she could tell was her dog, Koya, an Alaskan Klee Kai. “All day at work I held it in and didn’t tell my mom. I wanted to tell Trini first,” Kelsey said. Kelsey is nearly 15 weeks along. The couple plans to wait to find out if baby Loya is a boy or a girl. Check the TMH website for weekly posts, videos and updates. Being a mom may be old hat to Daina Wagner, 31, but that doesn’t dampen the joy she feels over having another child. This is the first child with her husband Wayne, which only adds to the excitement. “I love being a mom. It has always been my first and foremost joy and reward in life,” Daina said. Besides mom and dad, the Wagner family consists of Ezra, 10, and Kydalin, 8, who attend Maybell Elementary, and Dallis, 3. Daina grew up in Grand Junction, attending Palisade High School, then moved to Craig. Her parents are Mike and Theresa Rhodes. Wayne is a Craig native. The couple, who married last October, lives on a ranch a few miles west of Craig where they enjoy riding dirt bikes with their children and playing with their dog, Eminem. Daina and Wayne run their own businesses from the ranch—Hard Candy Salon and Diversified Welding and Fabrication (DWF). At the Wagner household, having a baby is a family affair: “I have a lot of support at home,” Daina said. Daina is nearly 20 weeks along, and she feels great. Check the TMH website for weekly posts, videos and updates.